The architectural style is Richardson Romanesque. Henry Hobson Richardson, 1838 - 1886, was a very famous and influential architect practicing in the New England area. Nineteenth century architecture can be anachronistic. It is the century of the industrial revolution and it will produce the first skyscrapers. But architects of the century look back in time for inspiration. Throughout the century designers revive Classical Greek ideals, medieval design, the Italian Renaissance, a bit of New Kingdom Egypt, a smattering of Moorish, and on occasion enthusiastically combine a number of borrowed styles in one building. Richardson was enthralled with the look and the character of Romanesque architecture and is responsible for the movement known as Romanesque Revival. Romanesque style (meaning Roman like or in the Roman way) developed in Europe after 800 A.D. and lasted till about 1200 when it became outmoded by the development of Gothic style and technology. Romanesque architecture does not look like ancient Roman architecture but it is built using Roman architectural systems; specifically, the round (Roman) arch, the barrel vault and the groin vault. Romanesque churches were thick walled,sturdy structures with small, arched windows and massive support columns or piers. 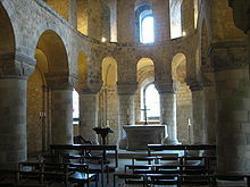 St. John's Chapel in the Tower of London is a good example of Romanesque style brought to England by the Norman conquerors. The unadorned simplicity of Norman Romanesque style will be changed as more sculpture and color are added by later generations. Technical improvements will allow builders to construct larger and larger churches. Simultaneously the era of the Christian Pilgrimage develops and the most spectacular examples of the style will be found along Pilgrimage routes. On the left is Tournal Basilica built around 1180 in Belgium. It is a very good example of High Romanesque style. On the right is Trinity Church, Boston designed by H.H. Richardson and finished in 1877. Richardson was already well known in the country. His ability to take medieval design concepts and restate them to suit modern sensibility, particularly the Victorian taste for grandeur, brought many commissions and a broad "school" of influence. 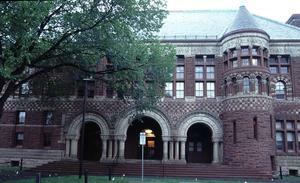 To the right is Austin Hall, Harvard University, designed by Richardson and finished in 1884. Round arches springing from carved capitals mark entry ways, a tower is incorporated in the facade and uses the the narrow, slot like, window openings one associates with medieval fortifications. There is a generous use of rough hewn (rusticated) stone work that is employed from the ground up. These two detail shots of the tower of City Hall illustrate Richardson's influence. One significant difference is that the Mason and Rice tower actually served a practical purpose as it functioned as the fire hose drying rack for the fire department housed immediately to the left of the tower. 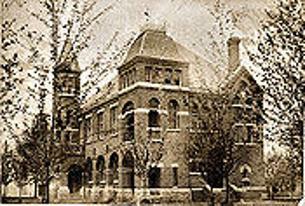 City Hall photographed in 1884. It is important and instructive to look back at the oldest photographs of City Hall to get beyond 20th century modifications. Without warning sirens, wrought iron, an addition, doors added in odd places and inappropriate replacement windows, we see a more cohesive, graceful design. The arch motif of the south facade can also remind us of a Renaissance loggia and the east side entry looks a bit grand.